The Middle Ages fascinates scholars and laypeople alike. The period has been romanticized, misrepresented, and misunderstood perhaps more than any other in history. Behind the imaginative stories of knights, castles, and epic quests there lies a medieval world that is every bit as incredible and intriguing as the fictional oneonly its people really lived, its events actually happened, and its achievements helped create the world of today. The two-volume Encyclopedia of the Medieval World provides a detailed look at this significant thousand-year period. Based on reliable and accurate scholarship, this comprehensive yet accessible encyclopedia covers the medieval world from Scandinavia to the Maghreb and Iceland to Moscow, including Byzantium, Seljuk and early Ottoman Anatolia, Armenia, the Kurds, the Levant, Syria, and Palestine. Approximately 2,000 entries offer exhaustive coverage on everything from significant personalities, archaeology, arts and architecture, institutions, literature, philosophy, and religion to economy, law, science, technology, politics, and warfare. Reflecting the changes in scholarly interest that have occurred over the last two decades, this encyclopedia is interdisciplinary and comparative with attentive detail to cultural and geographic subject matter. Topics that have been treated only marginally in previous publications on the Middle Agessuch as women, ecology, ethnicity, nationalism, and laborare treated more thoroughly here, making this an authoritative resource that readers with an interest in the Middle Ages will want to consult. Further readings listed at the end of all articles and a comprehensive bibliography in the second volume direct readers to the latest and most accessible scholarship. More than 120 black-and-white photographs and illustrations depict battles, significant individuals, artifacts, and more, and 52 stunning maps and charts make this period come to life. A detailed index, bibliography, cross-references, and chronology complete this magnificent encyclopedia. 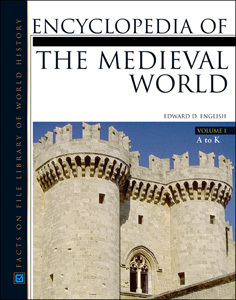 In a reference perfect for high school and college students, academic scholars, and general readers interested in the Middle Ages, Encyclopedia of the Medieval World covers more information than any single reference book of its kind. Travel and expansion (Eastern Europe, the Levant, geographical knowledge, ships). "...recommended to high-school, college, and public libraries that want to update or broaden their history reference collections."